You don't need to have an expansive balcony to put it to good use. Opt for space-saving furniture, like this rugged wood bench. Then make it cozy and inviting with a sheepskin throw over, add color and pattern with a runner, and place a plant in the corner. 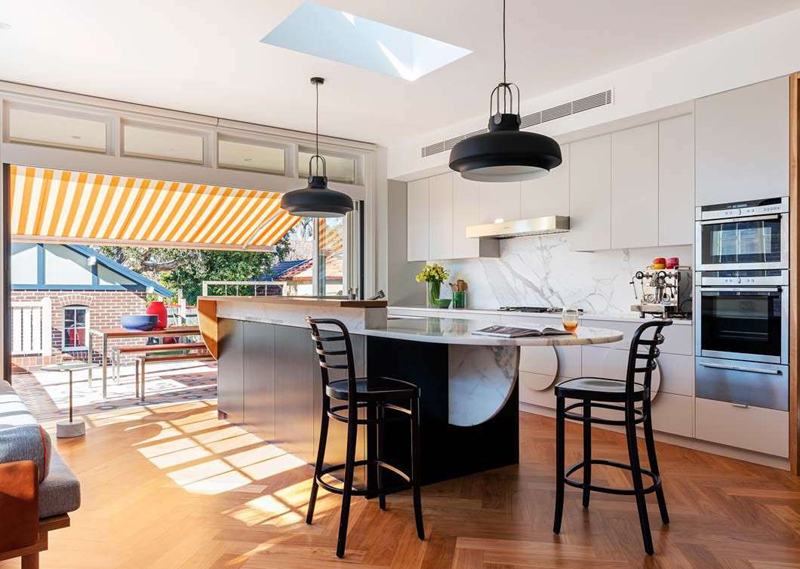 A bold metallic pendant light is a great way to jazz up your exteriors. But this isn't your living room. 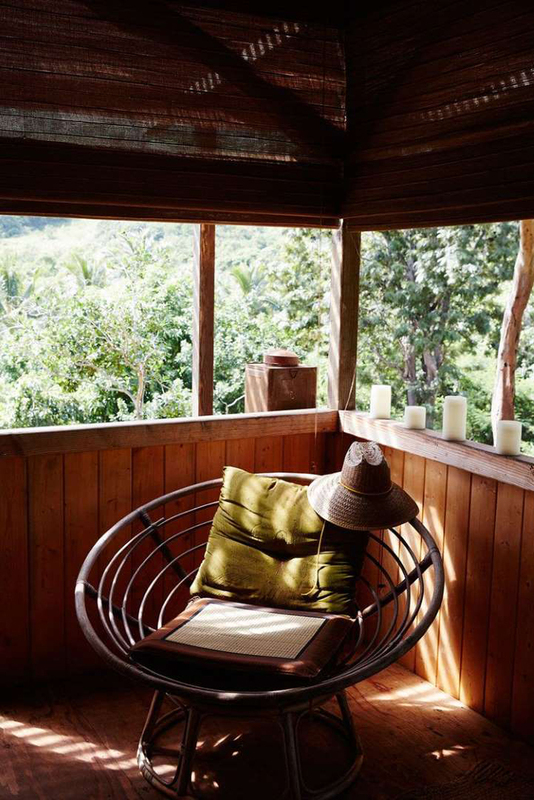 So to put it in the right context, incorporate nature-inspired materials burled wood ceramics, and anything rattan. If you have a great view and your living room opens right out onto the balcony, draw the eye outward with strategic furniture placement. 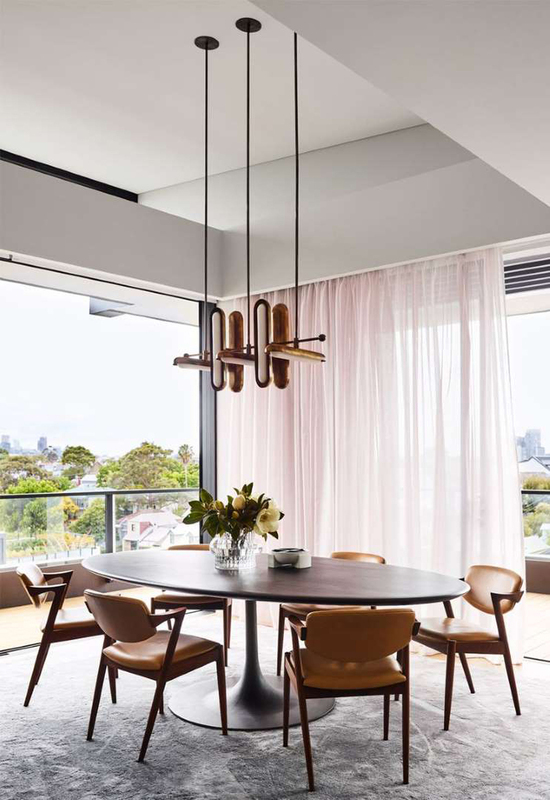 In this example, the sculptural chairs introduce a pop of red and direct our eye to the view, but they still belong to the same shape family as the oval blush ottoman and rounded coffee table. If you use your balcony as an outdoor dining room, create some shade-and bring in some style-with an awe-catching awning like this one. The bright yellow stripes add a cheerful edge. We love the primary color scheme with a blue bowl and red vase-they make the dining table pop. 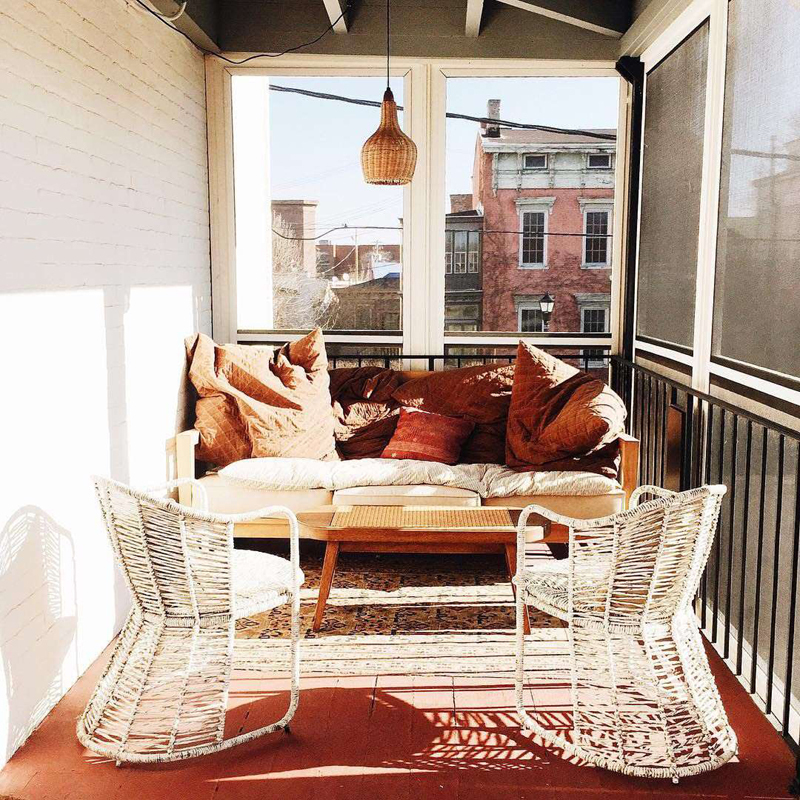 Use a living room design formula on your balcony to ensure it's a place you'll actually want to spend time on. Translation: Two arm chairs, a comfy couch, coffee table, pendant light, and area rug. Since it's an outdoor area, weathered piece and flea market finds will fit right in. Now's the time to let your inner plant parent shine. If you don't have space for a full-blown rooftop garden, your balcony is a great alternative. Just because your balcony is outside doesn't mean you can't channel your inner maximalist. Upholster your cushions in a fun color and paint your trims in a contrasting tone. Then hang drapes to make your balcony design feel as put together as your interiors. 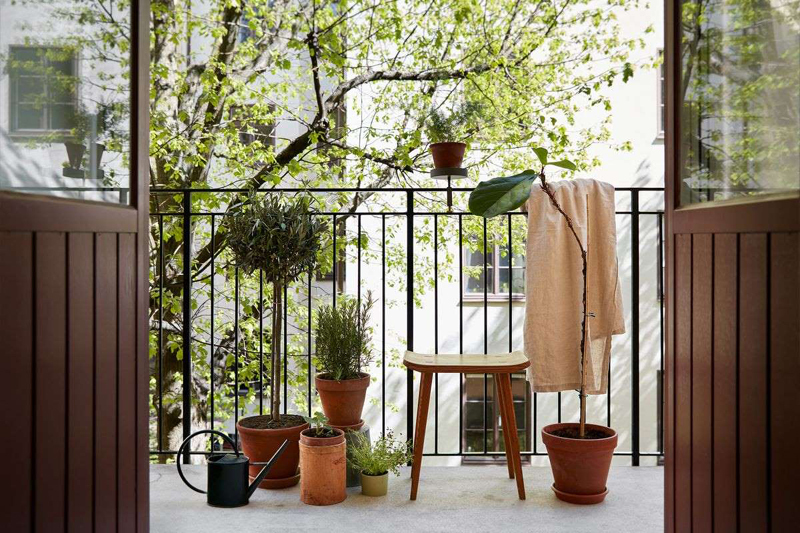 Large-scale planters and a statement-making chair are all you need for a modern balcony oasis. 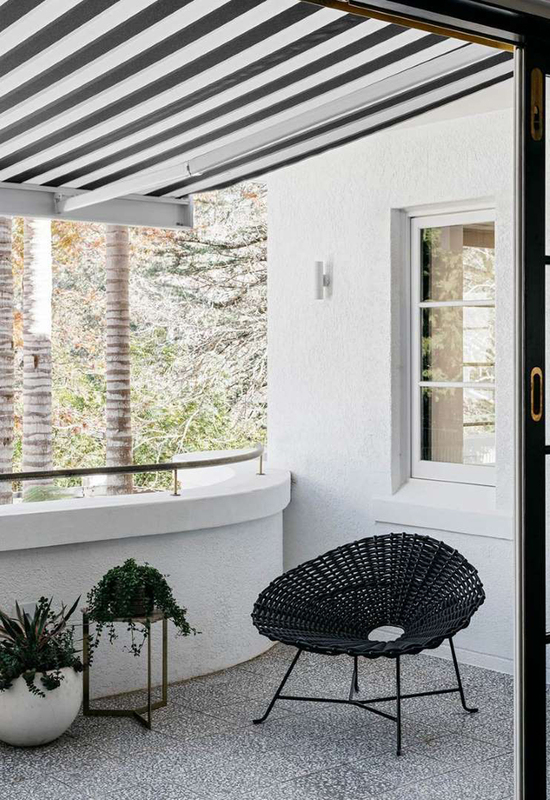 A graphic black and white striped awning, terrazzo tile floors, and sleek white sconce that blends into the exterior wall won't hurt either. To set an intimate scene on the balcony when the sun goes down, wrap some string lights around the railing. And of course, don't forget the staples: A runner, throw pillows, and a small stool or side table for your drink of choice. Window boxes are your friends! 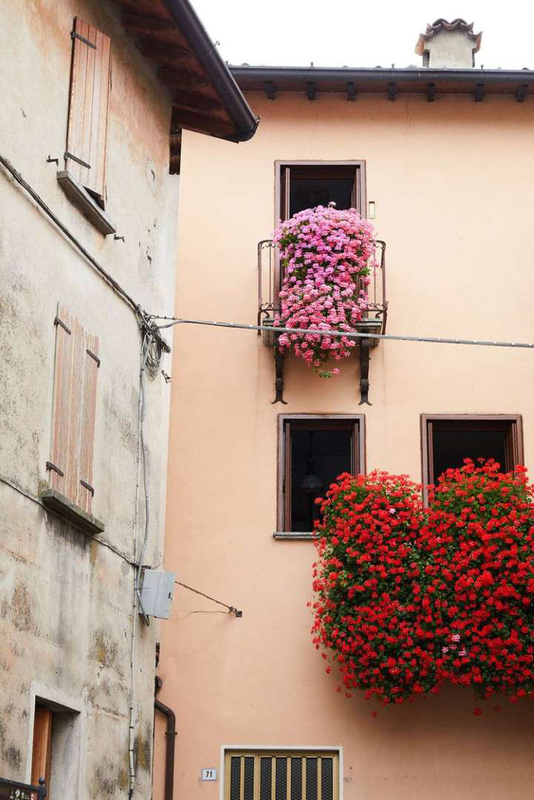 Balcony blooms like these will beautify an entire neighborhood. Besides, they can be even more stunning than a ground-level alternative, as the vertical perspective brings in an interesting, unexpected dimension. Plus, it's one of the easiest balcony decorating ideas around. If you have a wrap around balcony, accentuate that architectural detail by decorating your anchor pieces around the corner view. In this example, the striking dining room vignette is designed to lead our gaze outside to the balcony. And light pink sheers blowing in the wind have an undeniable appeal, not to mention the soft blush glow they emit throughout the entire space. 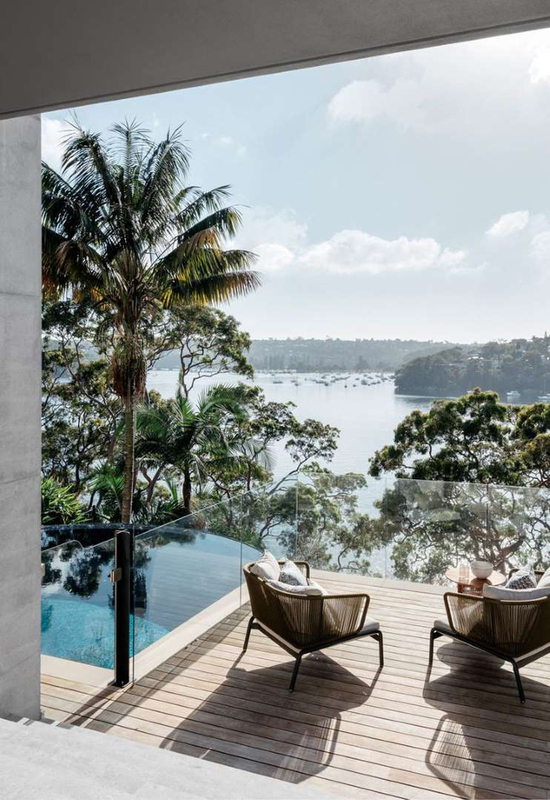 If your balcony is large enough, opt for some lounge chairs for reading and sunning instead of classic patio furniture. 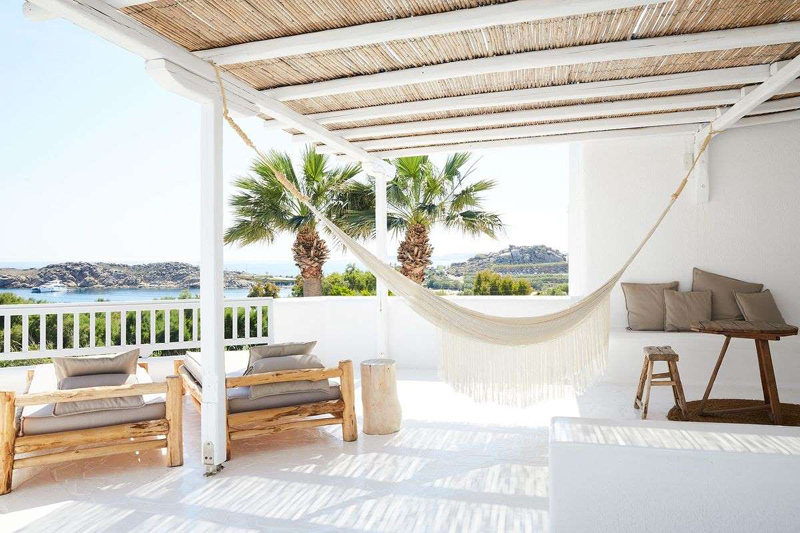 Then hang a hammock for open air naps. So you think your entryway is the only place to make a grand first impression? Not if you set up little console table for a design moment outside. 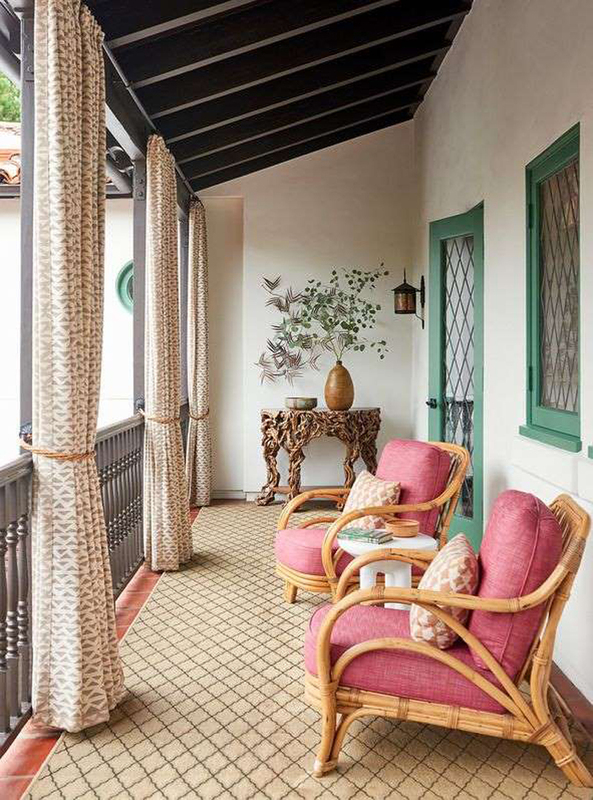 Your guests will see this balcony sanctuary before they even step foot inside. Line up some large candles for a romantic atmosphere. Just make sure you don't put them too close to the edge. Thens slide a papasan chair into the corner for bohemian style and comfort. Instead of a chair or larger outdoor sofa, opt for a slim bench. It'll take up less space but can be just as cozy if you add a cushion, throw pillows, and a blanket. A room divider can also create a nice illusion of privacy if you share the space with a neighbor. For something affordable and stylish, set up a seating area with a side table and butterfly chairs. 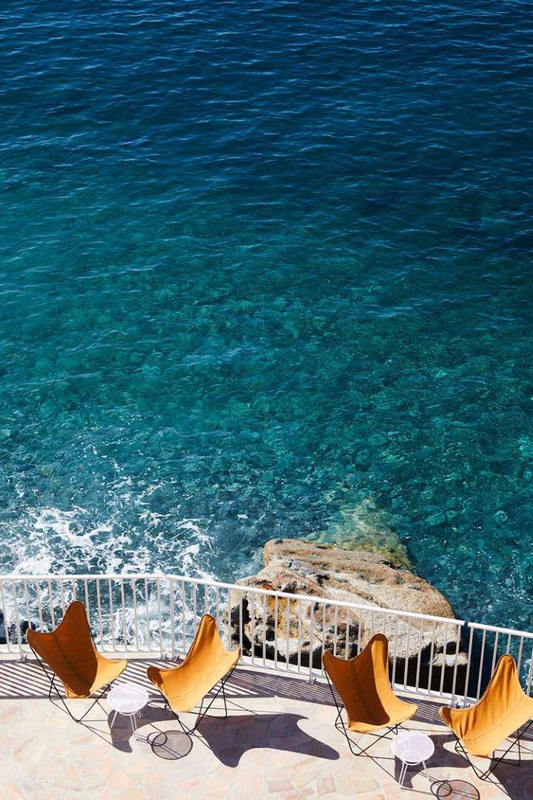 You may not be able to have this ocean view, but at least you can hang out on those cool seats. 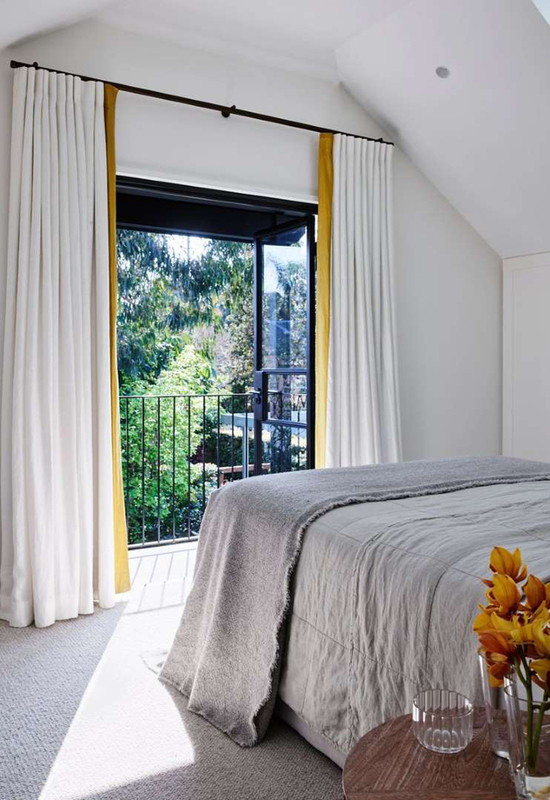 If your bedroom leads to a balcony, take advantage of that view by facing the bed outwards. 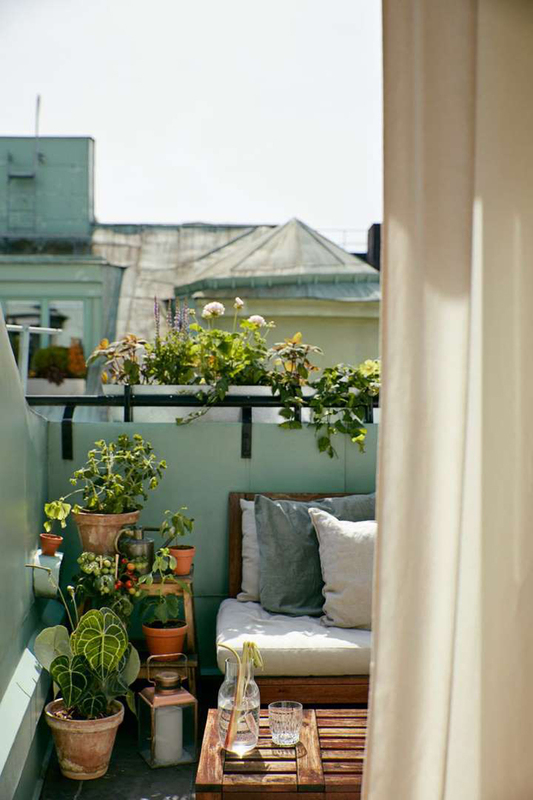 If your balcony is narrow anyway, don't load it up with furniture and décor that'll block the view. 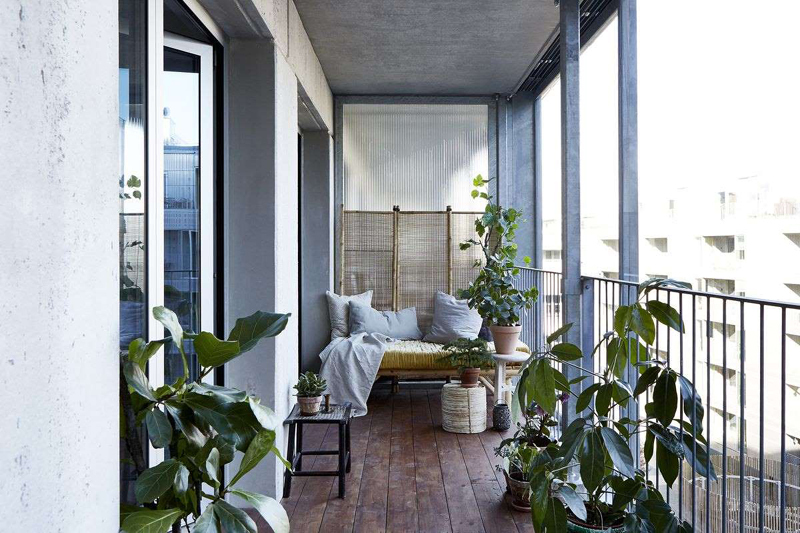 A bare bedroom balcony is more romantic. 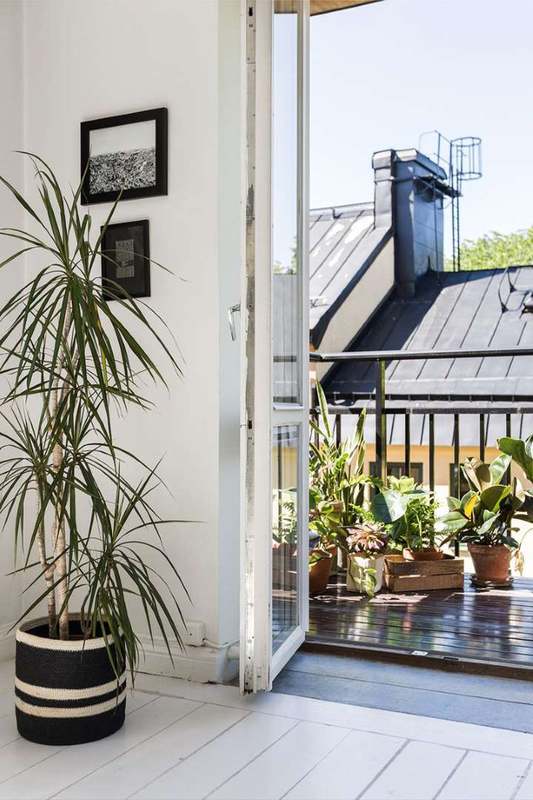 To make your balcony feel like a natural extension of your living space, place a planter in right inside the door. Opt for something a little dressier and more impactful than the pots you use for your outdoor plants. 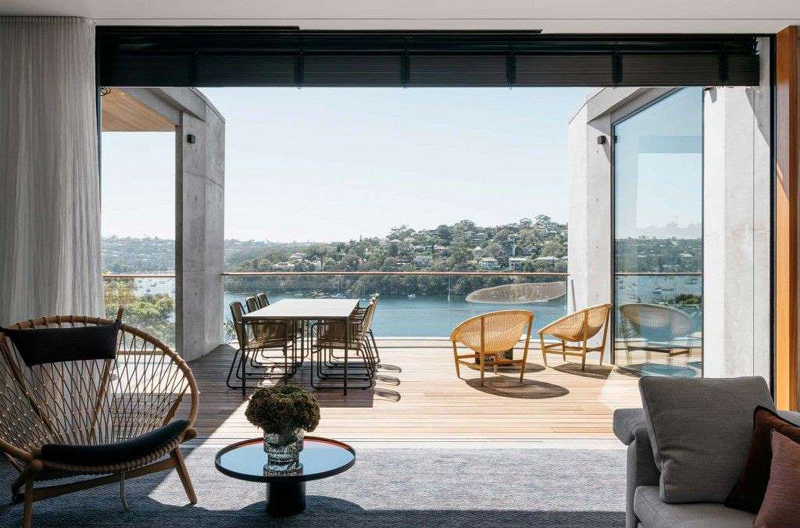 If your formal sitting room opens up onto a balcony and features floor to ceiling glass doors or windows, make sure your patio furniture blends in well with the interiors. As is the case here, the barrel lounge chairs on the balcony are just an outside interpretation of that looker inside. If you love to cook as much as you love the outdoors, set up a mini garden and start growing your own herbs to cook with. It's the perfect place to do so if you don't have a big garden out front. 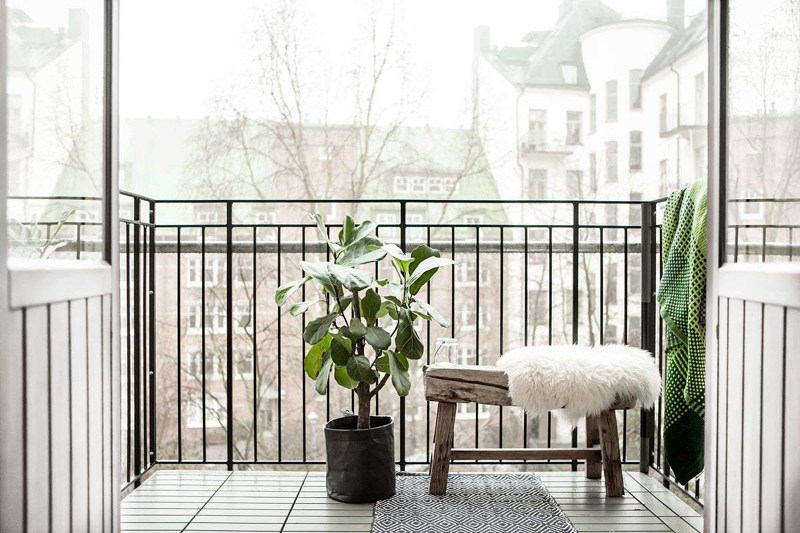 And this way, you don't have to invest in any balcony décor-the plants speak for themselves. 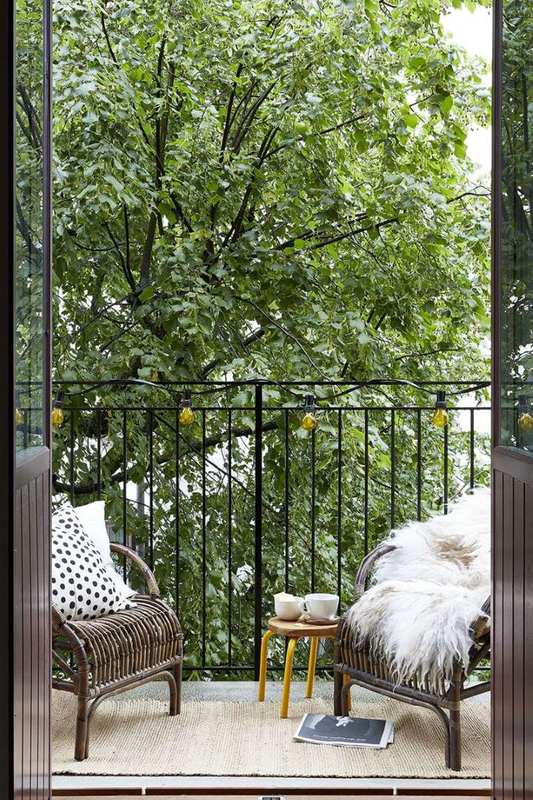 A subtle but transformative balcony decorating tip: Opt for glass barrier instead of solid or fenced off railings. This will make your balcony feel like it leads straight into the sky ahead. 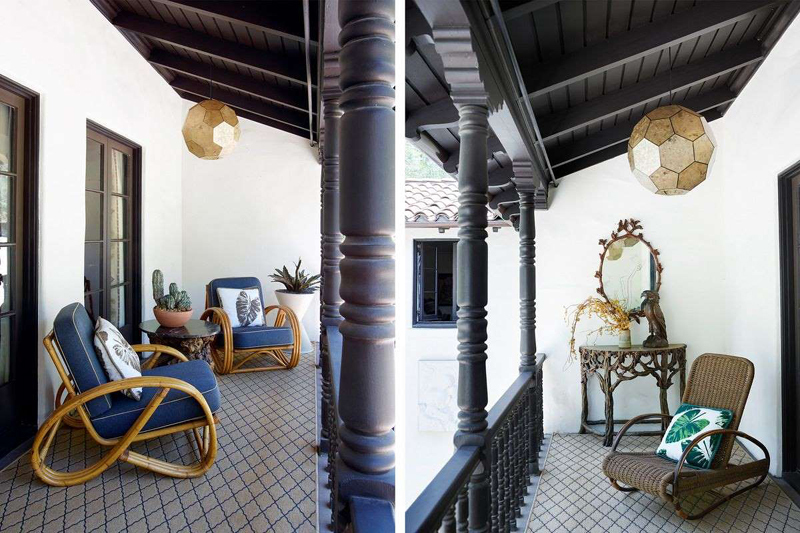 Plus, they have an edgier, sleeker aesthetic, so if your home is modern, they'll blend right in (literally).